The Bowflex BXT116 Treadmill is the right exercise platform for people who want to stay fit without having to go to the gym on a regular schedule. Getting a treadmill nowadays usually entails seeing a wide variety of one-of-a-kind exercise treadmills that boast of excellent performance and convenience. Staying fit nowadays can happen right in the comfort of your own home. You don’t have to go to the gym to follow your exercise regime. When you have the right exercise equipment at home, you don’t have to waste gym fees anymore. It’s time to get healthy and fit, so get a treadmill for your home exercise convenience. The 3.0 horsepower motor gives you an intense workout by giving you a speed range of 0.5-11 mph or 0.8-17.7 kph. You can also adjust the incline to 0-12% so that your workout is a bit more challenging. With quick speed keys, you can easily alter your settings to suit your preferences. You can create your own exercise profile or use the 15 workout programs integrated into this cardio exercise machine. It is also helpful to have different workout routines so you can test your resistance level. The fifteen workout programs built in the trainer include running, cardio, speed jogger, heart strength/recovery test, calorie goal and distance goal to mention some. You can use these programs to exercise, or you can personalize your exercise routine. This treadmill is indeed a great piece of equipment for your home. Not only will you have a good workout here, but it also has a big sized walking and running platform so you can comfortably do your exercise. There also is a Strike Zone deck cushioning that provides you with a soft landing and firm lift-off. The LCD display of Bowflex Treadmill allows you to track down your exercise metrics as you follow your program. You can monitor the vital program information of your exercise. Whether you are running, jogging or walking in this generously-sized treadmill, you are sure to keep watch over your heart rate by looking at the LCD display. Whether you just want to stay in shape or you are an athlete, this treadmill will surely give you the workout you have been looking for. Be careful to choose among the hundreds of models of treadmill that you will find in the market. If this model becomes unavailable, you should check out the replacement Schwinn 860. Bowflex BXT116 Treadmill is an excellent professional treadmill that has gained worldwide fame as a unique model of workout machines. 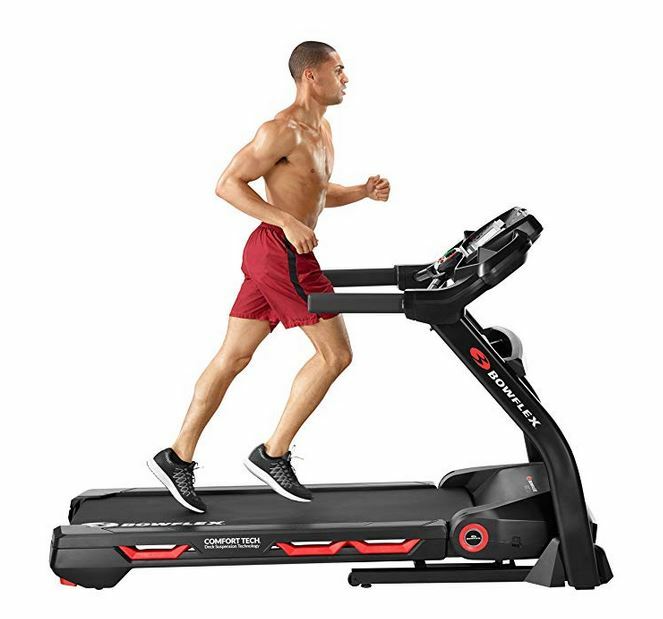 Compared to other high-level treadmill companies, such as Nautilus and Schwinn, Bowflex has proved to have bigger dimensions and a better display. As is the trend with modern treadmills, this model is easy to use, easy to set-up and easy to maintain for an extended period of time. It has impressive built-in programs that can shape up people of all ages and sizes, and a deck size that has enough space for even the largest of men to run comfortably. The folding technology included in this version is flawless, and that helps this massive machine to fit in tight spaces. The heartbeat monitor, considered the BXT116 Treadmill’s crippling flaw, has been reported to lag. It is obviously a problem to keep track of the workout session if the readings take time to appear, but the overall pros of this machine far outweigh the cons.